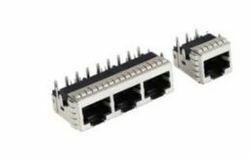 With the support of our team of experts, we are engaged in providing wide range of Modular Connector. Our innovative interconnect solutions range from high-speed, high-density pluggable connectors to consumer I/O and legacy D subminiature and modular jack connectors. Now you can combine modular contact inserts with an individual plug-in connection: everything in one housing for transmitting data, signals, and power.